Ht / Wt: 6'0" / 240 lb. 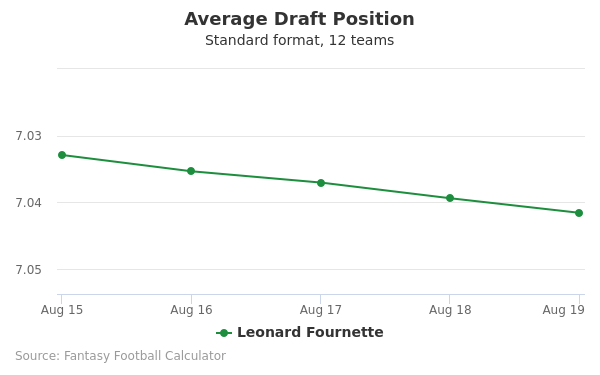 Leonard Fournette's fantasy value is measured by his average draft position (ADP) in fantasy football mock drafts. 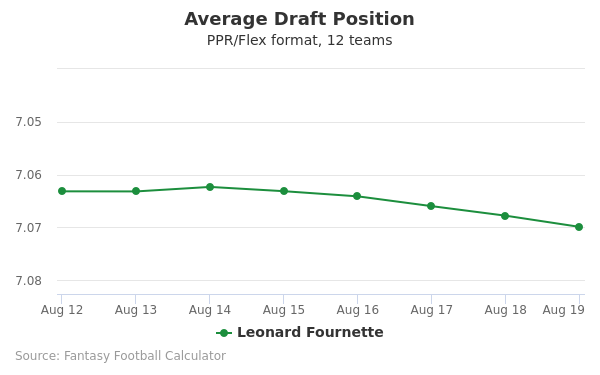 In recent drafts, Fournette's current ADP is 3.03, which indicates that his fantasy outlook is to be the 3rd pick of the 3rd round, and 26th selection overall. 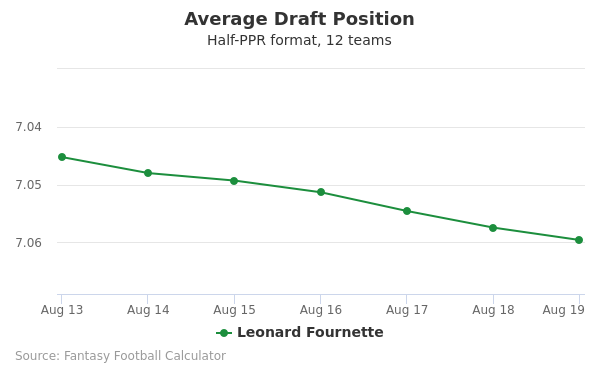 The code below will display a graph that updates every day to show the ADP data for Leonard Fournette for the past 30 days in 12-team PPR leagues. Draft Adam Thielen or Leonard Fournette? Draft Leonard Fournette or Sony Michel? Draft A.J. Green or Leonard Fournette? Draft Keenan Allen or Leonard Fournette? Draft George Kittle or Leonard Fournette? Draft Leonard Fournette or Mark Ingram? Draft Aaron Jones or Leonard Fournette? Draft Amari Cooper or Leonard Fournette? Draft Leonard Fournette or Phillip Lindsay? Draft Derrick Henry or Leonard Fournette? Draft Leonard Fournette or Stefon Diggs? Draft Aaron Rodgers or Leonard Fournette? Draft Devonta Freeman or Leonard Fournette? Draft Chris Carson or Leonard Fournette? Draft Brandin Cooks or Leonard Fournette? 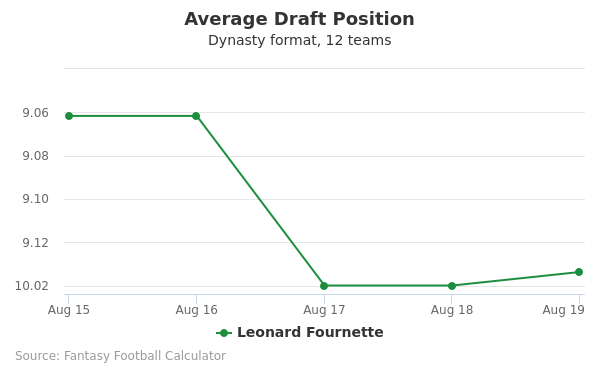 Draft Derrius Guice or Leonard Fournette? Draft Andrew Luck or Leonard Fournette? Draft Kenny Golladay or Leonard Fournette? Draft Kerryon Johnson or Leonard Fournette? Draft Cooper Kupp or Leonard Fournette? Draft Eric Ebron or Leonard Fournette? Draft Leonard Fournette or Robert Woods? Draft Julian Edelman or Leonard Fournette? Draft Leonard Fournette or Tarik Cohen? Draft Baker Mayfield or Leonard Fournette? Start Adam Thielen or Leonard Fournette? Start Leonard Fournette or Sony Michel? Start A.J. Green or Leonard Fournette? Start Keenan Allen or Leonard Fournette? Start George Kittle or Leonard Fournette? Start Leonard Fournette or Mark Ingram? Start Aaron Jones or Leonard Fournette? Start Amari Cooper or Leonard Fournette? Start Leonard Fournette or Phillip Lindsay? Start Derrick Henry or Leonard Fournette? Start Leonard Fournette or Stefon Diggs? Start Aaron Rodgers or Leonard Fournette? Start Devonta Freeman or Leonard Fournette? Start Chris Carson or Leonard Fournette? Start Brandin Cooks or Leonard Fournette? Start Derrius Guice or Leonard Fournette? Start Andrew Luck or Leonard Fournette? Start Kenny Golladay or Leonard Fournette? Start Kerryon Johnson or Leonard Fournette? Start Cooper Kupp or Leonard Fournette? Start Eric Ebron or Leonard Fournette? Start Leonard Fournette or Robert Woods? Start Julian Edelman or Leonard Fournette? Start Leonard Fournette or Tarik Cohen? Start Baker Mayfield or Leonard Fournette?